The annual meeting of the TENNESSEE MUNICIPAL LEAGUE (TML) will be held June 10-13 at the Embassy Suites in Murfreesboro. We hope that all of our clients and friends will visit us at the Ice Cream Parlor. This event gives our firm an opportunity to express our gratitude to all those who serve Tennessee’s communities. The annual WATER PROFESSIONALS CONFERENCE (the joint meeting of the KY-TN AWWA and WEA) will be held at the Lexington Center in Lexington, Kentucky, July 9-12. Our Ice Cream Social is expected to have many participants and we certainly hope to see you during this year’s event! A draft of a water system evaluation has been submitted to the Owner for review. A bid opening for improvements to the Peak Wastewater Diversion Pumping Station was held April 11 with W&O Construction being the low bidder at $754,600. The Capacity Assessment Plan, Sewer System Evaluation Survey Work Plan, Fats, Oils and Grease Control Program, Sanitary Sewer Overflow Response Plan, Pump Station Operation and Preventive Maintenance Program, Continuing Sewer System Assessment Program, Infrastructure Rehabilitation Program, and Information Management Systems and Capacity Assessment Report are complete and approved by EPA as part of the Administrative Order of Consent. SSES work is ongoing and is 75 percent complete. 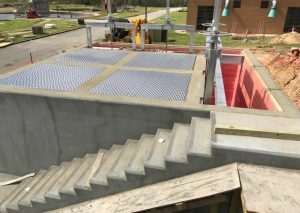 The Carters Creek Pumping Station Renovation project in the amount of $651,000 is complete and in close-out. The new water mains for the Holiday Drive and Lantana Estates Waterline Replacement Project, which consists of the replacement of 19,000 L.F. of 6-inch asbestos cement waterline, have been installed. Clean-up is underway. Design work is complete for the Meadowpark and Holiday WTP Improvements project which includes constructing a new chemical building, as well as sandblasting and painting the pipe gallery, and replacing the existing settling basin equipment. A bid opening was held April 25 for the Meadow Park Water Treatment Plant Generator Project with Trinity Contracting Services Co., LLC being the low bidder at $233,466. The Sewer System Rehabilitation project, in the Kayser Roth area, in the amount of $432,000, is under construction. Dynamic Construction is the Contractor and the project has a completion date in July. The design of Industrial Park Water and Sewer System Improvements is underway. Design work is underway for the State Route 30 utility relocation. Funding through the Tennessee Economic & Community Development Site Development Program has been announced for a 12-inch water transmission line from FCUD’s Clarkrange Tank to the Industrial Park. 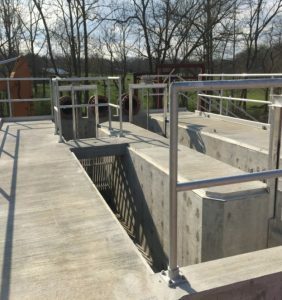 Construction of the 1.0 MG Vine Street Water Storage Tank Renovation, constructed by Preferred Sandblasting of Shelbyville, Tennessee at a total contract amount of $845,700, is complete and closed out. 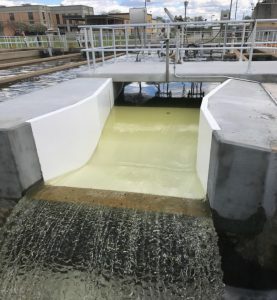 A preliminary engineering report was provided to HWU for improvements to the South WWTP Aeration Basins. HWU selected an alternative which includes replacement of the existing aeration system with 9- inch disc fine bubble diffusers. The geotechnical exploration is complete and preparation of plans and specifications are underway. Construction of the North Wastewater Treatment Plant Final Clarifiers No. 1 & No. 2 Rehabilitation project is underway. M. Bowling, Inc. was the low bidder at $713,892. The Contractor is working on concrete repair and awaits the arrival of the clarifier equipment in May. The project has an expected completion date of September 2017. Design for the Water System Rehabilitation project funded by Appalachian Regional in the amount of $500,000 has begun and the environmental is underway. The bid opening for the 2016 Community Development Block Grant focusing on Water Rehabilitation was held May 9 with Contracting Services of Culleoka, TN being the low bidder. A report for inclusion in a 2017 CDBG Water Rehabilitation project was submitted to South Central Development District for a partnership grant between Hohenwald and Lewis County. Awards are expected to be made Fall 2017. A bid opening for the sewer extension to Farm Credit Services, which will accommodate future growth, was held May 16 with Cumberland Pipeline, LLC being the low bidder. Design work is underway for the $33.5 million Hammond Wood WWTP Expansion. Design work is underway on the new estimated $8 million Wastewater Treatment Plant. Humboldt Utilities was awarded a Site Development Grant for a waterline to the Industrial Park. The $313,385 project was awarded to Barsto Construction and has a completion date of May 19, 2017. Design work on a Sludge Dewatering Facility for the WWTP is underway and an application for EDA funding has been submitted. A final report for inclusion in a 2017 CDBG Renovation project at the Wastewater Treatment Plant was submitted. Awards are expected to be made Fall 2017. The NPDES Permit Renewal has been prepared and submitted. Construction on the $2,999,257.48 Miller Avenue Wastewater Treatment Plant, with Garney Construction, is underway with the Peak Flow Diversion Structure and effluent Parshall flume complete. Piping work is underway. The project has an expected completion date of August 11, 2017. A $13.3M Disaster Community Development Block Grant was awarded for five separate projects including Miller Avenue WWTP work, sewer line replacement and rehabilitation, sewage pumping station renovation, and dual South Fork Forked Deer River utility crossings. Design work is underway. A preliminary engineering study for renovation of the Water Treatment Plant is underway. Construction of water and sewer relocations for State Route 50/431 has begun. A report for inclusion in a 2017 CDBG Sewer Rehab project was submitted to South Central Development District. Awards are expected to be made Fall 2017. Improvements at the Water Treatment Plant including Backwash/Water Supply Modifications have begun with Contracting Services being the low bidder at $179,560. Backwash valve pit is in service, PR valve pit is set, and 20” failing lines have been replaced. A completion date of May 2017 is scheduled. A Water System Capacity Study is underway. Design of the Monroe Water System Improvements is underway which consists of 33,000 L.F. of 6 and 8-inch waterline and a booster station renovation. Survey work is complete. A pre-construction meeting was held February 6 for a project providing for the clean out of Polishing Pond No. 1 & No. 2 at the Wastewater Treatment Plant. Low bidder was W&O Construction with a bid of $229,168. Work is scheduled to begin mid July. 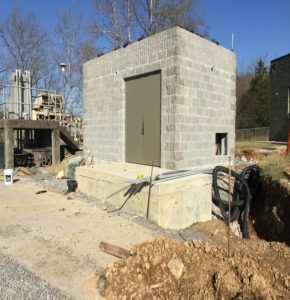 A report for inclusion in a 2017 CDBG WWTP project was submitted to the Upper Cumberland Development District. Awards are expected to be made Fall 2017. Design is nearly complete for the Renovation of Six Sewage Pumping Stations. A bid opening was held for the Madison Square Area Sewer Improvements, consisting of 3,500 L.F. of 24-inch sewer, with Twin States Utilities & Excavation, Inc. being the low bidder at $798,870. A pre-construction meeting was held May 3 and a commence work date is planned for May 15. Survey of approximately 10,000 L.F. of new 6 & 8-inch waterlines, a booster station, and new 250,000 gallon elevated tank for the north high pressure zone is complete and design is underway. Water Quality Modeling work is underway to determine the impacts of a reconfigured effluent discharge concept. The intensive field sampling is complete and calibrated model was accepted by TDEC. Currently, scenarios are being prepared for permitting negotiations. Design of a new Sludge Thickener Building and two new belt presses is 50 percent complete. Phase I Water Improvements, which include 15,876 L.F. of 16-inch North Transmission Line, in the amount of $965,089, are complete with cleanup remaining. Minor tank valve vault work remains and a change order for approximately 3,000 L.F. of 6” waterline is in process. Construction of 21,000 L.F. of 3-inch and 4-inch waterline on Baizetown and Cave Ridge Roads, is complete and closed out. The Water Treatment Plant Lagoon Sludge Removal project is complete with a change order approved to clean out Lagoon #1. A Manhole Rehabilitation bid May 16 with Spectratech being the low bidder. The NPDES Permit Renewal application has been prepared and submitted. Preliminary work on the rehabilitation of approximately 5,000 L.F. of gravity sewer and upgrading the Harwell Heights and Robinhood Road sewage pumping stations is underway. Phase II of the TDOT State Route 128 road widening utility relocation plans have been submitted to TDOT for a scheduled letting of June 2017. A report for inclusion in a 2017 CDBG Sewer Rehab project was submitted. Awards are expected to be made Fall 2017. W&O Construction was the low bidder for the $2.8M renovation of the 2.16 MGD SBR Wastewater Treatment Plant. This project is progressing as planned with the electrical building electrical panels in place, all major equipment set with the exception of the bar screen, effluent pumps and blowers. A completion date of October 2017 is expected. The design of a new 1.6 MGD Sequencing Batch Reactor Wastewater Treatment Plant is scheduled to bid June 1. The final NPDES Permit has been issued by TDEC. A report for inclusion in a 2017 CDBG Sewer Rehabilitation project has been submitted. Awards are expected to be made Fall 2017. Construction of I-69 Phase III utility work is complete with clean-up remaining. The 2016 Utility Rehabilitation project, with John T. Hall Contracting at $1,579,347 being the Contractor, is underway with 700’ of sewer remaining and 30 percent of water work completed. A completion date of June 2017 is expected. A preliminary engineering report has been submitted in efforts of obtaining a FastTrack grant for an Industrial Park Waterline.